One of my all-time favorite things IN THE WORLD is the Up Series, a British documentary series that follows 14 socio-economically diverse 7-year-olds throughout their lives. 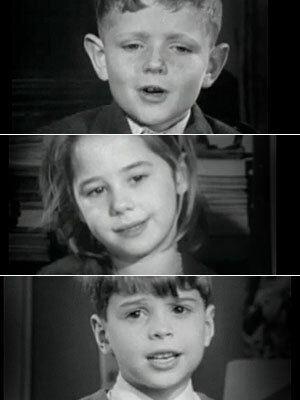 Interviewed about their dreams, ambitions, passions and beliefs for the 1964 film Seven Up!, these children were revisited again seven years later — when they were 14, then again at 21, and so on. Now, the "children" are 56 years old, and the latest of the films — 56 Up — is about to be available in the United States. Here's a trailor for it. The films were based on the aphorism: "Give me a child until he is 7, and I will give you the man." Filmmakers Paul Almond and Michael Apted wanted to test the hypothesis that a child's social class predetermines his or her future. To this end, they interviewed three wealthy boys from an exclusive pre-prep school, a group of working-class girls, a boy raised on a farm, another from a suburb, two kids from charity children's home, a boy intent on becoming a missionary for God, and so on. The original idea was that, by age 7, life circumstances have set a child's nature and outlook to such a degree that not much will change for the rest of his or her life. Limiting, right? Very. But also fascinating. From the moment you meet them, the differences between these kids are startlingly apparent. I tell you this, in part, because my daughter is now 7, and, for the first time, I really understand why that particular number was chosen. Suddenly, for the first time, I find myself being able to paint a pretty complete portrait of my daughter's future self. Unlike the toddler years, or even at ages 5 and 6, children at 7 are predictable and consistent, firm in their likes and dislikes, forward-thinking, thoughtful, wise and full of personality. As the Up Series shows, not all of these "imagined portraits" come to fruition — and who knows if mine will — but many do. More than you'd think. And how strange that is! To have a baby and then seven years later be picturing them, pretty easily, as an adult. It's shocking. And surreal. And, when it's not breaking your heart, it's totally awesome, too.